Get your gasps of horror, disappointment, disgust, and pity for my ignorance out of the way now. Now, take a deep breath, open your mind, and read on. I am a (mostly) natural parent, I breastfeed my nearly three year old son and will continue to do so until which time he decides he's finished, and I medicate with Zoloft. I know, I know - what about chiropractic, aromatherapy, acupuncture, and herbs? I tried some. At various times in my life, I tried them all (except the acupuncture, which I tried to try, but I was turned away because of some complications with my pregnancy). Therapy and Zoloft is what worked (and continues to work) for me and I am not only unashamed, but quite pleased with and proud of myself for taking care of me so that I may continue to take care of my family. I wasn't always "out" about my choice. I used to be embarrassed. I used to feel a failure. I used to feel like I would be shunned by my own community (you know, based on the stream of negativity seen on any thread about the issue). So I stayed closeted. I even attempted to wean myself off the meds. That's one way to spell disaster. Luckily, I came to my senses. I take Zoloft. 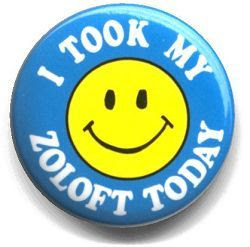 I take Zoloft and I'm OK. And you know, you are, too - whether you take meds or not. Bravo!! We could accomplish so much more if we spent more time understanding that everyone needs something different and this isn't a competition to be the best, greenest, most natural parent out there. Hooray for you for doing what you need to be the best mama possible to Zen Son. I used to take an antidepressant but after birth it made feel weird so I quit. But during pregnancy it was a life saver! Pharms can be great when all other options have not yielded the desired results. Not sure why you kept your Zoloft use a secret. I took it while pregnant and prior (I tried weaning before TTC but it was a disaster) and it was such a big help to me I told everyone I knew. Since then I was able to wean off but it took me 9 freakin' months to taper off of 10 mg. And I still miss it. :( I too have PTSD with some mercury toxicity screwing up my brain function. I never had PPD and taking Prozac plus coffee in the morning made night nursing a dream; I never once felt sleep-deprived. I didn't keep anything a secret, it just didn't come up. Despite my openness on the blog, I'm actually a very private person. You shouldn't be ashamed of treatments that are making you well. What's important is you're feeling better and free of pain. I just hope you try chiropractic care and acupuncture too. The results of your therapy can turn better when paired with these.